Do you find yourselves wearing hats or visors while also wearing a sweatband because you want to keep the sweat out of your eyes especially while running? Well, then you should check out Headsweats. A fantastic company that makes headgear with sweatbands built into the inner rim of their hats, GENIUS I know. Plus at a reasonable price. It has an elastic stretch band in the back so it’s easy to slip on and off, perfect for triathlons. It kept the sun off my face and sweat out of my eyes as well as water when I was splashing it on my head while racing. The Hi-Vis line is my favorite because they are perfect for being seen in the sun and in the dark and it comes in both the supervisor and race hat. I use the race hat when it’s too hot outside and too sunny where my scalp may burn. As someone who has a very high arch, I need arch support and these socks do it. Even when your shoes have been worn down and don’t provide as much arch support, these socks take care of that problem. They are soft, comfy and above all else compression filled. Featured in the photo are the Elite Merino wool socks for those cold winter days when the regular ones just won’t do. They are not bulky, they are soft and keep my toes very warm. They also make a max cushion, light cushion and ultra light option for their Elite line that are great for everyday wear, training days and on race day when it’s super hot outside. Feetures also makes a line of compression socks that I like to wear during recovery. Feetures was just rated the best running socks for Competitor and the proof is in the pudding. They are the best and the only socks I will ever run in. These gloves are great for winter because if it’s really cold out or windy, the mittens option provide you with more protection while keeping you nice and warm. But if you start to overheat, just fold the mittens back and into the pocket provided. I enjoy having both options because there are days when the wind is too much and you need that extra coverage. I also enjoy wearing these because of the highlight reflective piping to help you be seen during the dark days of winter. These are my personal favorite and I highly recommend them. I officially switched to lock laces and am glad I did. They made slipping my shoes on every single day much easier and not having to worry about tying my laces before I head out the door or having to lace them over and over again while I am running. They are even more important during triathlons in T2. 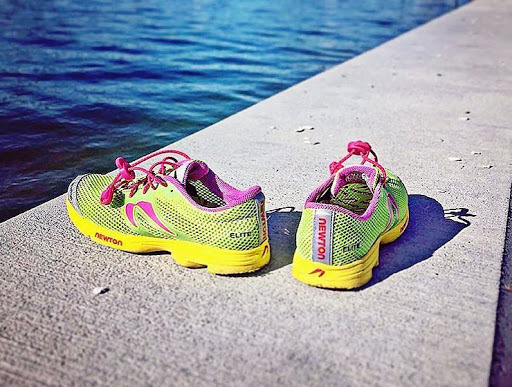 So if you don’t want to worry about tying laces during races or everyday runs, consider switching to Lock Laces. 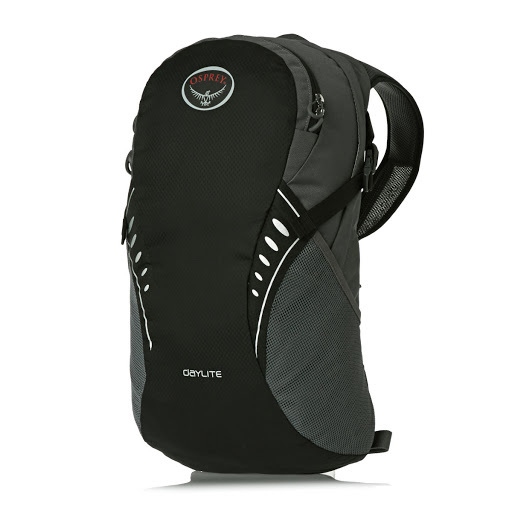 The Osprey bag has been a great casual and running bag. What surprised me the most was how much space is in it. You can fit a pair of shoes, clothes and a bike helmet comfortably into the large pouch, while also fitting your keys, wallet, and phone into the smaller pocket on top. Even when the bag is full, it is comfortable to run with. The straps tighten the bag to your back and the foam pad keeps it stable, so there is no bounce or space when you run. The straps are also laid out perfectly not to chafe any part of your body. This bag is my go to and has become such a savior for commuting. It is not heavy or positioned awkwardly like regular backpacks or sits low on your back causing back pain. 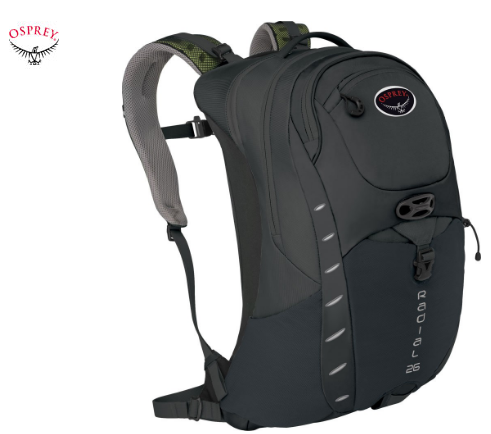 It is a quality backpack with a water resistant shell that tucks away on the bottom of the bag, includes two side pockets that stretch and can fit any size water bottle, a hook for keys in the front pocket, perfect for if you have a work badge that you don’t want to keep taking out and putting away, you can just clip it to the key hook. It also comes standard with a front pocket that stretches, perfect for your bike lock, a plastic loop for storing a helmet, adjustable straps across the chest and waistline as well as the typical straps that go over the shoulders. For as long as I can remember, I have been wearing Oakley’s. I received my first pair when I was 14, the light blue minutes and fell in love with them immediately. Unfortunately, over time, they discontinue models and the sunglasses lenses started to deteriorate and let’s be honest when the sunglasses are 10 years old that will happen. So I invested in the Commit SQ. I was a little hesitant at first because they have an open lens on the bottom, but that hasn’t been an issue at all. I love Oakley’s they are incredible sunglasses and I wear mine every time I race or train because the lenses aren’t so dark that it is impossible to see out of in the evening. Oakley’s make all different kinds of sunglasses so it really is about your preference, but the one thing I love is that they last forever! AfterShokz created the Trek Titanium to help athletes be worry-free about running and listening to music. The bone conduction headphones are open to the ear so you can hear your surroundings while also listening to the music playing. The headphones are lightweight, pairing is simple and once you do so, you can listen to music, make and receive phone calls and go about your day. The headphones are very easy to use, comfortable and the setup process is simple. The BlueBuds X provide incredible comfort and sound to make your runs easy and enjoyable. The wire is adjustable, the setup process is easy, it can take and make phone calls and the best part, if you are a USATriathlon member, they offer 20% off! Want to read up on more of my review for these headphones? Click here! I like to call these my headphones on steroids because they offer more options than I have ever experienced before. Not only is the sound wonderful and clear but the headphones are very comfortable. The headphones provide the option to measure your heart rate monitor with the earpiece. The battery life is pretty long (if you do not use the app) and the mouthpiece has a microphone with the ability to make and receive calls, change the volume and songs. The only negative I had with these headphones was the pairing process. It was a little challenging to set it up.